The Milwaukee XC M12 Sub-Compact Band Saw is the most compact and lightweight cordless band saw on the market. At less than half the weight and size compared to a traditional deep cut band saw, the M12 Band Saw provides one-handed power and portability to electricians, maintenance professionals, and other users cutting small diameter materials. The M12 Band Saw weighs only 6.75 lbs. and 12 inches in length, making it ideal for overhead or one-handed cutting applications. This powerful saw can cut through -inch EMT in only three seconds, and will deliver over 150 cuts per charge with the included M12 REDLITHIUM XC High Capacity battery. With a 1 5/8-inch x 1 5/8-inch cut capacity and low vibration, the M12 Band Saw performs clean cuts on the most common small diameter metal cutting applications. Backed by Milwaukee's<sup></sup> 5-year warranty, the 2429-21XC comes equipped with M12 REDLITHIUM XC High Capacity battery, 30minute charger, (1) 18 TPI metal cutting blade, and a hard carrying case. M12 12V Lithium-Ion Cordless Sub-Compact Band Saw XC Kit W/ (1) 3.0h Battery, Charger & Hard Case The Milwaukee XC M12 Sub-Compact Band Saw is the most compact and lightweight cordless band saw on the market. At less than half the weight and size compared to a traditional deep cut band saw, the M12 Band Saw provides one-handed power and portability to electricians, maintenance professionals, and other users cutting small diameter materials. The M12 Band Saw weighs only 6.75 lbs. and 12 inches in length, making it ideal for overhead or one-handed cutting applications. This powerful saw can cut through -inch EMT in only three seconds, and will deliver over 150 cuts per charge with the included M12 REDLITHIUM XC High Capacity battery. With a 1 5/8-inch x 1 5/8-inch cut capacity and low vibration, the M12 Band Saw performs clean cuts on the most common small diameter metal cutting applications. 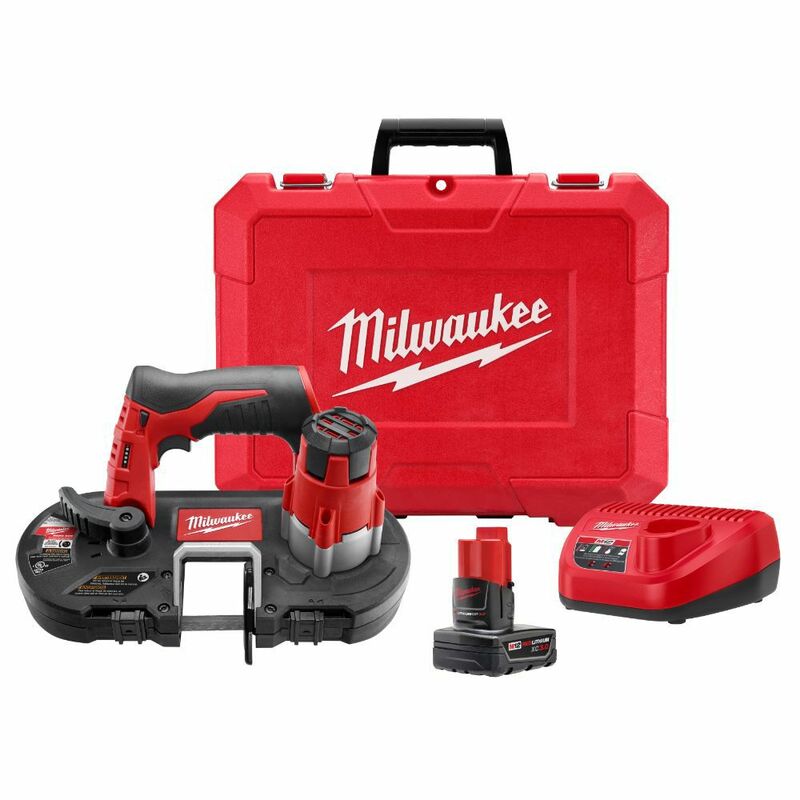 Backed by Milwaukee's<sup></sup> 5-year warranty, the 2429-21XC comes equipped with M12 REDLITHIUM XC High Capacity battery, 30minute charger, (1) 18 TPI metal cutting blade, and a hard carrying case. M12 12V Lithium-Ion Cordless Sub-Compact Band Saw XC Kit W/ (1) 3.0h Battery, Charger & Hard Case is rated 4.7 out of 5 by 159. Rated 5 out of 5 by James from Replacing the blade is fast and easy, the dumb apprentice... Replacing the blade is fast and easy, the dumb apprentice can even do it !!! Oh wait... that’s me great for cutting 1/2” to 1 1/4 pipe, can cut shallow strut with ease, has a harder time with deep strut but still gets the job done, the batteries only do about 20 cuts before they die! Great tool ! Rated 5 out of 5 by Milnitti from Meet my expectations money well spent. ... Meet my expectations money well spent. Rated 5 out of 5 by LopezLopez from One of the best power tools by Milwaukee. Hoping for... One of the best power tools by Milwaukee. Hoping for a brushless upgrade. Can this saw cut both metal and wood?? Is there interchangeable blades if so?